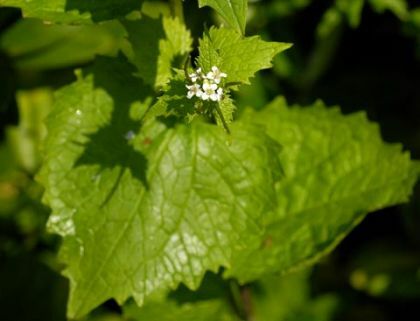 Garlic Mustard is not easily confused with other wild plants on this web site. 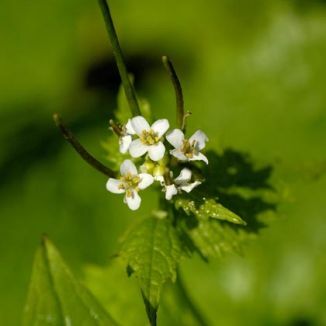 Almost hairless, Garlic Mustard is a quite commonly seen wildflower of wood margins, roadsides and hedges. Sometimes reaching over 1 metre high, this hairless biennial has erect stalks which bear white 4-petalled flowers (3-5mm across) in elongated racemes. The glossy leaves are long-stalked and distinctively heart-shaped with bluntly-toothed margins. They bloom from April to June and are followed by seeds in erect cylindrical siliquas (long, thin seedpods). This is a native plant which belongs to the family Brassicaceae. My first record of this plant is in 1977 in Dalkey Park, Co Dublin and I photographed it there in 2008. This plant is called 'Garlic' Mustard because of the smell obtained by crushing the leaves or roots. It is still used medicinally in treatments for sore throats and there are several recipes available to make pesto, to flavour fish and meat dishes and to eat raw in salads. It is also known as Jack-by-the Hedge and is a larval foodplant of the Orange-tip butterfly.